The 1898 Pelican Egg is made of red gold, diamonds, pearls, gray, pink and opalescent blue enamel and watercolor on ivory. The stand is made of varicolored gold. 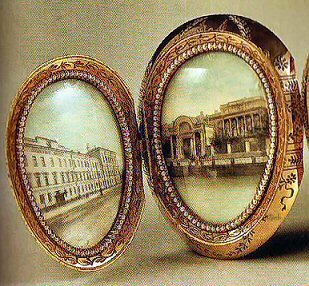 The Egg itself unfolds into a screen of eight ivory miniatures. The Pelican Egg commemorates the centennial celebration of the patronage of charitable institutions. The institutions are depicted on an extending folding screen of eight ivory miniatures, each within a pearl border. The miniatures are painted by court miniaturist Johannes Zehngraf on ovals of ivory. On the back of the miniatures are listed the institutions portrayed. On the photograph above, the back of the miniatures. The "ninth panel" is clearly seen as a "stand" for the unfolded miniatures. 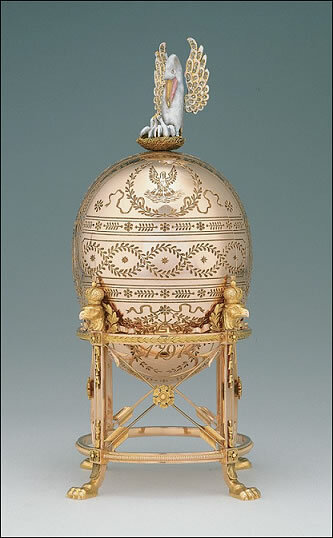 The Egg is supported on a varicolored gold, four-legged stand and retains its original red velvet case, the only time this color was apparently used for a Imperial Easter Egg-case. 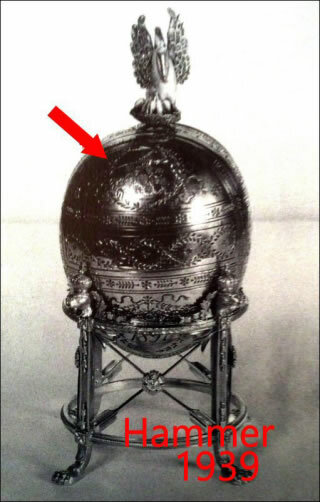 Because of the dates "1797 and 1897" on the Egg, for many years the Pelican Egg was ascribed to 1897, but the found of the original Fabergé invoice apparently indicates that this Egg was presented to Maria Feodorovna for Easter 1898. 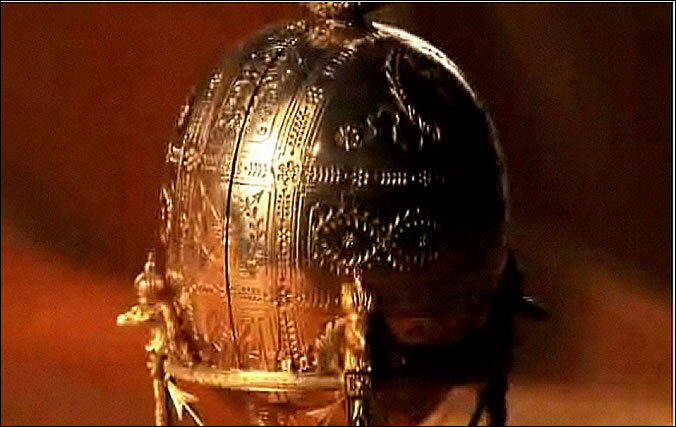 In 1930 The Pelican Egg was one of the ten Eggs sold by the Antikvariat to the Hammer Galleries, New York. Between 1936 and 1938 bought by Lillian Thomas Pratt. 1947 Collection of the late Lillian Thomas Pratt, willed to Virginia Museum of Fine Arts, Richmond, USA. Update August 2010: In "A Fresh Look at the Pelican Egg" the institutions on the miniatures are visited and the Egg is seen in its historical context. Update April 2012: To see the Egg open, watch the YouTube movie below. Update 2013: The Egg seen sideways, screenshot from a promotional video, convinced me that stand and Egg belong together. 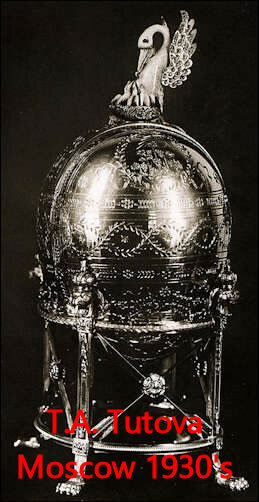 Update 2017: A 1930's photograph of the Egg while still for sale in Moscow, shows the front of the Egg with the date 1897 and the engraved grapes (growing grapes under sunshine), and not the engraved pelican and the date 1797, the way the Egg is displayed today as seen in the upper most picture. Armand Hammer in 1939, when Mrs. Post already owned the Egg, had it photographed with the date 1897 too on the front for his Exhibition Catalog, Фаберже Fabergé his Works (image above right). The left image is courtesy the Fabergé Research Site, Newsletter Spring and Summer 2017. These images prove that nowadays the wrong sides of the Egg are displayed as front and back. For more on the significance of the pelican and grapes engravings, see A Fresh Look at the Pelican Egg, Historic Connections. When you download the App, (App Store or Google Play) you can read about the historic backgrounds of the "key players", journey through a classic Russian fairytale and create virtual miniature egg charms. To watch the Egg and see the beautiful details by using the Zoom function, go to the Zoom function on its VMFA webpage by clicking here!